Skin discoloration in African Americans can be the result of overexposure to the sun, healing blemishes or healed injury to the skin. This discoloration is brought about when excessive amounts of skin pigmentation, called melanin, is distributed to the affected area. There are ways to fade dark spots and return normal skin tone; however, people with darker skin tones should take extra precaution to avoid further injury to the skin. Apply a skin lightening cream to the discolored area. Lightening cream bleaches the skin by reducing accumulated amounts of melanin. These creams can be found in over-the-counter versions or by prescription from your dermatologist. Directions for use depend on the strength of the product. Wear SPF 15 or higher sunscreen when outdoors. Ultraviolet rays will worsen dark spots and prevent their fading. Protecting your skin from the sun's harmful rays will help excess melanin break down on it' own, fading hyperpigmentation. Opt for a chemical peel from your dermatologist. Chemical peels work by removing dead skin layers until fresh skin is revealed. This slowly peels away the discoloration with several treatments. Make sure you use a licensed dermatologist for this procedure to avoid skin injury. Avoid harsh, abrasive skin care treatments. These will only worsen hyperpigmentation and prevent it from healing. 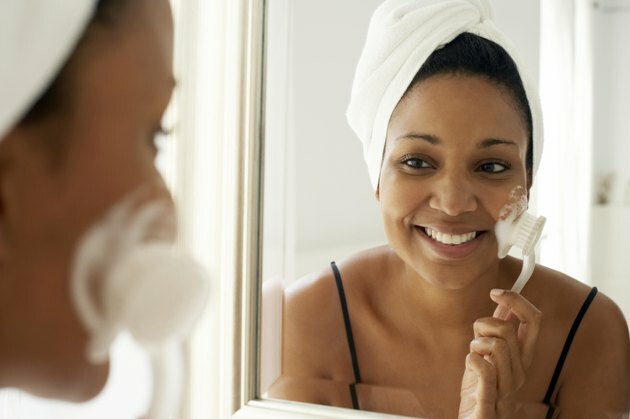 Use moisturizers that are noncomodegenic after gentle exfoliation with an oil-free cleanser. This will cause melanin to evenly distribute throughout the skin. Drink eight to ten glasses of water per day to keep the skin well hydrated. This flushes out toxins in the skin that may contribute to excess melanin production and help clear the skin of darker spots, evening out the skin tone.